III Europae, Galliam, Belgicam, ac Germaniae, partem. Map of the Low Countries (Netherlands, Belgium), France, and western Germany from the Mediterranean to England. By Gerard Mercator, from his rendition of Ptolemy’s Geography. Originally published in 1578, this is is a later (ca 1695) edition from Francois Halma of Utrecht. A single centerfold, as made for inclusion in the atlas folio. Some minor marginal wrinkling and wear Hand-laid paper with chain lines; blank verso. Measurements are of the image; page size is much larger. Please see scan for exact condition of this fine copperplate engraving. 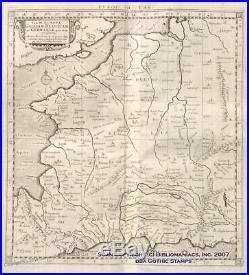 Absolutely guaranteed original, antique map over 300 years old. All items are absolutely guaranteed genuine as described. We are members of the American Philatelic Society (APS), the American Stamp Dealers Association (ASDA), and the German Philatelic Society (GPS), are a Colorado corporation (dba Gothic Stamps, Inc) and have been dealing in philatelic and numismatic items since 1992. International Buyers Please Note. We cannot mark items as’gift. We are required to put the actual value of the items won on each package. Please look at the postmark when the package arrives. We are professional, full-time dealers in business for many years, and we treat your lots with care and consideration in a timely manner. The item “1695 Belgium France Germany Europe Antique Map 32536″ is in sale since Thursday, May 31, 2018. This item is in the category “Antiques\Maps, Atlases & Globes\Europe Maps”. The seller is “germanpostalhistory” and is located in Colorado. This item can be shipped worldwide.